The message of revival that I have been bringing is predicated on the prophesies that are in the Book of Joel, both those about the last great revival that is coming and those about the times leading up to it. But the foundation for the whole message rests upon a base of 6 vital principles of revival. These principles never change. Throughout time, they have been the bedrock foundation that all revivals have been based upon. The first principle to understand is that revival is not about feeling good, having exciting church services, or receiving wonderful blessings. It’s not even about the miracles or the outpouring of the Spirit. Those are all results of revival, not the core focus. Revival is about winning souls – first, foremost, and always. The primary reason God sends revival is so that the Church will rise up and shine the Light of Salvation to the millions of lost souls who are on their way to Hell. God is not willing that any should burn in Hell, but He uses His Body to bring that message of hope to them. Jesus said that if He be lifted up, He will draw all men unto Him, and that is what revival is all about. The second principle of revival is that the Gospel of Jesus Christ is not about you. The Gospel is about others, others, others. The Church has been flooded with messages that are all about what God can do for you, how Jesus wants to bless His people, and all the blessings and good things that God will give you. It’s almost as if all we want to talk about is not how we can serve God, but how He can serve us. Gone are the admonitions about taking upon us the sufferings of the Cross, walking that crucified walk in subjection to His Will, and the call to sacrificing it all for the Cross. We have to take our focus off of ourselves and place it on others. This is the very essence of Charity in 1 Corinthians 13. Agape is not just a “love” that is little more than some warm fuzzy emotion; it is love in action, the giving of yourself out of love so that souls can be saved. If you don’t grasp this concept, you will never be able to understand the Cross. Jesus died to save sinners, and He calls us to that follow Him into that same calling. “Deny thyself, pick up your cross, and follow me.” Until you get your focus off yourself, God cannot begin to bring revival. The third principle to understand is that there is a price to pay for revival. Nothing in God is free. And the price for revival is high – so high, in fact, that that is the reason why true Holy Ghost revivals are so rare. You cannot expect to sit in church and wait for God to drop a revival into your waiting lap – it will not happen. At some point, you will have to get up and do something … but if you do nothing, nothing will happen. God will not send His precious souls to a people who do not care enough to answer the call to battle and fight for them. If you draw nigh unto Him, He will draw nigh unto you. There is a price to pay. The fourth principle is very like the third in that revivals have to be prayed in. This is not a light statement. Throughout history, before every revival you will see the saints laboring in intense prayer, sometimes for years, before God begins to move. And not the light, easy-going “little talks with Jesus”, but the ferocious contending before the Throne of God that moves the Almighty. We must be as desperate as Rachael in Genesis 30:1 when, as a barren wife, she cried out to her lord, “Give me children lest I die!” Prayer moves God; but if you want a great move of God, it takes great prayer. If you want it to rain, you have to pray like Elijah. The fifth principle is that no revival comes without repentance. If the cry for revival is not accompanied by true heart-rending repentance, then nothing will change and we will remain stuck in the same apostasy that killed the last move of God. Two good examples are in Nehemiah and Daniel. Nehemiah was the king’s cupbearer and heard of the desolation of Jerusalem. Before going to the king in supplication to restore the city of God, however, he first fasted and prayed day and night in repentance for the children of Israel. Daniel likewise, when he read Jeremiah’s prophesy that after 70 years, Jerusalem would be restored, did not call his friends to sing and rejoice, but rather, he fell to his knees in repentance for his people. Daniel knew that even though it was written in the Word of God, revival would not come without repentance. The last principle is a little different than the others. It is not about something we need to do, but rather what God provides for us. I have noticed that every revival is started by someone who has a vision for revival. There is always someone who is lit on fire by a vision that is greater than what he sees around him. He is the lightning that starts the fire. Gideon sought the face of God in secret and would not compromise with the Church that had been taken over by the world, and because of that, the angel told him to go in that strength and he would deliver Israel. Jonathan was willing to climb up the rocks on his hands and knees to take on the enemy, no matter what the odds, because he believed God could deliver them. In every place where you see a picture of God’s deliverance and ensuing revival, you will see a man of God who looked beyond his circumstances and believed God for revival. All the other conditions for the fires of revival may be there, but it takes a man or woman with a vision to strike the first match. Revival is coming, folks. Where it will strike first and how fast the fire will spread is a matter of conjecture, but wherever it strikes, you will find all of the above underlying it. Pastor Patrick came to Mbarara three years ago to visit his newly married niece. His church was located about 50 miles away, and it was suffering from the typical spiritual doldrums that it seemed all the churches in Uganda, and all of Africa for that matter, were suffering from. Uganda had taken part in the wonderful revival that had swept across Africa in the early ‘70’s, but it had been cut short by the demonic persecution from Idi Amin. That move of God has dissipated into a boring mediocrity and a resulting decent into sin and corruption within the Church in general. He didn’t know what to do or how to bring life back into his church, but he was determined to seek the face of God for an answer. His niece’s husband had a church in Mbarara, but unlike so many others, this church had a new infusion of life. There was something exciting going on here. There was not only hope, but it was if they had discovered a new direction and a vision for revival that had been lost since those exciting days 40 years ago. They were having a 3-day seminar on revival by some American friend of his nephew, and he decided to attend. After two days, he could hold it in no more and armed with a booklet from the American revivalist, he raced back to his community without even telling his nephew what had happened to him. He didn’t really know himself what he was going to do next, but he knew he had a hold on the answer to end the apostasy that had been suffocating his church. He started preaching right out of the booklet. Starting with his own church, he challenged them with the principles of the Word of God that were laid out in the booklet. It was like shattering a glass ceiling that had hung over their faith – they could see through the glass into the very heavens, but never could get past it. But now it was shattered, and a new freedom and purpose gripped his congregation and they headed into their community to win souls. A fire was ignited that spread throughout the whole area. During the next three years, Pastor Patrick planted 70 new churches, with many other existing churches asking to join him. A steady stream of sinners came to answer the call for Salvation, and as the Spirit of God began to move, the miracles began to happen. The sick were brought to the church to be healed and the tormented to be delivered. Joy and rejoicing had returned to the House of God. God had lit a fire. I preached in Pastor Patrick’s church yesterday. The only way I can describe what it was like is to say it was not just exciting, it was exhilarating. I don’t think very many people knew who I was, but that’s okay. For me, it was just a little pat on the shoulder from God to encourage me and lift me up as I struggle through the final days of this very difficult trip. You never know what God can do with even just a single seed. I’m sitting on the porch of my hotel listening to Country & Western music in the middle of the Ugandan jungle. The contrast strikes me as funny. I have this feeling come over me that I’m coming home. Soon. Just a few more things to do before I leave. Yesterday we drove 4 hours out to western Uganda to visit the Pygmies. A couple of years ago when we visited this area, we sparked a move amongst the churches here to reach out to the lost and bring them into the House of God. I have preached the message that revival depends upon our obedience to the Great Commission, not the other way around. The prophet Joel is very clear that the reason God has cut off His Spirit – the corn, the wine, and the oil – from the house of God is because we have let the harvest of the field perish. Simple. Fix that, and God will restore us. 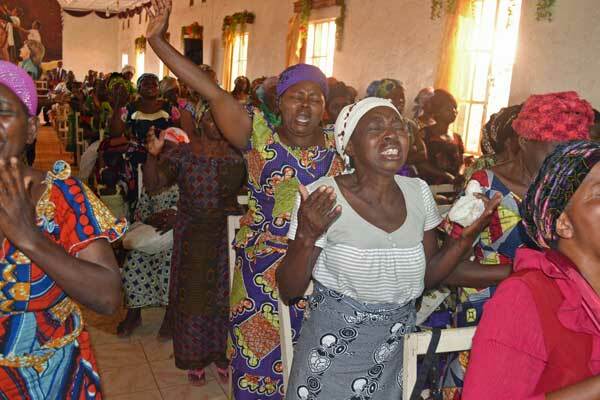 The pastors here realized that they had oppressed and persecuted the Batwa (Pygmies) because they considered them as sub-human, even to the point of killing them as if they were varmints. All of a sudden, Holy Ghost conviction crushed them to their knees to cry for forgiveness and sent them out to save the lost. It worked. Pygmies, for the first time in history, began to get saved. It started with a couple of parents and a healing miracle for their son and has grown now to multiple churches here in the forest. I was at one yesterday and watched as 15 more came down to the altar to accept Jesus Christ as their personal Savior. There is so much more that needs to be done. They are desperate for survival because the government has pulled them out their forest homes and dropped them off in the surrounding villages with a tiny plot of land and some mud huts that are crammed together. They do not have sufficient land to grow food and no skills to make a living, so they are starving. Sickness is rampant among them, but there is no medical clinic anywhere near, so they die in alarming numbers. There is little hope. What can I do? I purchased a couple big sacks of maize for them, but what happens when that is gone? I tried to buy them some Bibles, but the price out here is $25 each, a price I cannot afford. I will have to wait and get them in Kampala and have them shipped. I am just one little guy with no organization or church supporting me. A large Baptist church in Waxahachie has said they want to get involved – oh, they feel the burden! They want to come out here and help with this wonderful move of God – but almost a year later, there is not even a single dollar bill or even a whiff of interest in extending themselves past the empty wind of inflated words. What does Proverbs say? “The talk of the lips tendeth only to penury.” Talk is cheap. Just as Esther was a type of the church that is insulated behind the palace walls of comfort and prosperity, so we of the Western world would do well not to ignore God’s warning to us lest we fall into the trap of Laodicean prosperity of being rich and increased with goods, but not realizing that we are, “…wretched, and miserable, and poor, and blind, and naked”. America has had a rich history of bringing the Gospel to the entire world. We had set the world on fire at one time, but now there are but glowing embers where once a flame burned with holy zeal. Our restoration, revival, and even our salvation relies not upon our previous laurels and accomplishments, but on a determined zeal to reach out again to the lost and fulfill the Great Commission that God placed upon America to be a light to the world, city on the hill to bring the Gospel to a dark world in these last days just before Jesus returns. If we miss the time of our calling, enlargement and deliverance for the world will arise from another place, but we will face the judgment of God reserved for the unmerciful. We’re done in the Congo. What a different experience that was! I am glad to be done but I feel like I am missing something and there’s a slight heaviness inside me. There was something about the Congo that was very hard and dark and was like pushing through a swamp of thick darkness, like wading through soup. Hard to describe, but you’d know what I meant if you had been here. Nigeria is similar, but with a different feel. Don’t ask me to explain it. I’ve been in dark places before and they are always hard, but something about the Congo wore me out. True, I was preaching two and three times a day with few breaks. Typical “church preaching”, which is more like giving a spiritual lecture to your friends, does not wear you out, but when the anointing falls down on you and washes through you and pours out over the pulpit, it drains you like nothing else. You can ask Noah. He can tell you what it has been like and how drained I am at the end of the day. Still, there was something hard about the Congo that wore me out after barely 3 or 4 weeks. Maybe if I had read more or prayed harder; maybe my physical health was not fully recovered from the heart attack; maybe it was the weather,… Whatever it was, I ran out of gas after Uvira. They had cancelled the meetings in Kalemi because the rebels were fighting along the road that led to that city, and they made some quick arrangements for a small place called Baraka. I could have gone. Actually, I could have gone to Kalemie if I had just taken the boat around the fighting. But I didn’t. I grasped at what seemed like a wonderful opportunity to run. Nobody blames me, especially Noah. He was going through the same stuff that I was and was just as ready to go as I was. Baraka seemed like a poor substitute for Kalemie. It was hastily slapped together and I’m not even sure the people in Baraka were expecting me, so it was not a big deal if I didn’t go. Everyone knew I had been pushing hard this past month, even too hard. But none of that reassures me. I could have gone. Maybe I could have made an eternal difference in who knows how many lives. Maybe they would have burst into revival and lit the fires everywhere else. Maybe, maybe. But I didn’t go. I simply ran out of gas. I am now sitting in Uganda in a nice hotel, burning up $75 a day. True, I need to organize the Ladies of Hope with their purses, get pictures and videos, and figure out the shipping and whatever else is needed to streamline the process – a much needed thing that cannot be done from home. I will also visit the Pygmies, which will do wonders to encourage them since they look at me as the Grandfather who was responsible for starting the whole movement that led to their salvations. And I will visit some churches that have been pleading for years for me to come. All good things, but did I miss a calling when I did not push through to Kalemie? Folks will say not to beat myself up, look at all you have done, but I remember learning early that the call of God will press you to take it all the way through and not stop just short of total victory. The heart of the struggle will always be in that last push at the end. That is true about all aspects of serving the Lord, including prayer and fasting, seeking His face, and overcoming sin. It’s that last drive to overcome that makes us victorious. Some will say that I am preaching a hardline Gospel that is extreme — and they would be correct — but it is against a backdrop of the stark reality of a vicious, intense spiritual war that cannot be seen with the carnal eyes but which is more real than the world we see. Wars are not won by compromise, neither are battles won by giving in to excuses. God gives us the power to fight those battles to the victory, but we must avail ourselves of that power. He won’t do it for us, but He will give us the power to do it. And He never said it would be easy. I don’t know if I was supposed to soldier on to Kalemi or not. Maybe I would have been so worn out and empty that I couldn’t have delivered what they needed to receive. Or maybe He would have picked me up and kept me going. Who knows? I do know this, however, that the battle for the Congo has only just started. These were the opening salvos in what will be a ferocious struggle to break through the decayed walls of dead religion and rekindle the fires of revival. They know that the message I bring has shattered the chains that they are under right now. They can see the victory. We just have to push it all the way through. I don’t know if I will be able to get back there. Money is the biggest challenge facing me. I am only able to do what I do because of a handful of faithful donors, but so much more is needed. Ultimately, however, it is not up to me to fight their battles for them – my job is simply to point them in the right direction. I may strike the match, but they have to fan the flames. Wars are not fought by single persons but by the entire army. You may say, what does that have to do with me? I am sitting in Christian America, sedate and secure. We have churches everywhere and everyone knows the Gospel. Yes, but you have no revival. Just a bunch of Laodecian churches, smothered in their comfort and mediocrity. I am convinced that our spiritual revival depends on the battles that are being fought right now in Africa. The fire will begin there and spread around the world. The War of Armageddon has begun. It is being fought in prayer rooms as true Christians rise up to meet the challenge and tear into the fervor of battle on their knees. It is just beginning, but the intensity will rise as we approach the focal point of the final battle. Warriors will be forged and heroes will rise; battles will be fought and victories will be won; but they will not be won through compromise or excuses. We have been called to fight, to overcome, and to win. A new thought can be a fragile thing. The slightest grimace or frown can extinguish it from blossoming. But sometimes a new thought, can get a foothold on possibility and can be a powerful catalyst in creating great things. That’s how it appears to be here in the Great Lakes of the DRC. We started in Goma at the top of Lake Kivu, moved down to Bukavu at the bottom of the lake, and now we are in Uvira at the top of Lake Tanganyika. Next week, we head further down Lake Tanganyika to Kalemi. This is a rift in the topography like a vertical line that produces lakes that are deep and long. It also may be the place where the Great African Revival begins. It’s just a new thought; a gut feeling, if you would. Back in America, folks would probably smile condescendingly at my ambitious optimism, but here that thought is gaining traction, not as a possibility, but as a exciting reality. I spoke to one of the main bishops here today. He has heard about the explosive services that we have been having. He sits there and stares at me as I recount the vision I have for revival – a new thought to us perhaps, but a living reality to him. This is what they’ve been waiting for, praying and fasting and crying out to God to revive them again like He did in 1971. They are convinced that the Lord has told several of them that He is sending someone to bring revival to this Great Lakes Area. They know it, they feel it in their bones, it cries to them out of their very soul. Just a new idea, but when they hear the message we are preaching and experience the Anointing that comes down in our services, that idea becomes a burning light. More like a flaming torch. Maybe this is why this trip has been such a never-ending battle. Satan knows. Or at least he can see the signs and can figure out what is coming. This is not a new thought for him; it is his worst nightmare. Like the bud of a tender plant breaking through the clods of dirt, reaching up to soak up the sunshine, this idea is coming up fast. Once it takes hold, it can grow to be a mighty Oak tree. Even a tree as great as the Tree of Life had to start from a seed. Such are the ways of a new thought. I knew it was going to be good; I just didn’t expect it to be that good. My last service here in Bukavu, Congo is at a fairly large church where we have been having the seminars for the pastors from this organization. 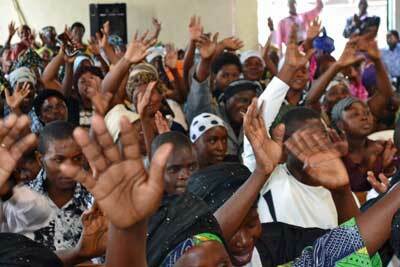 Cepac is the 8th largest denomination in the Congo, and these pastors have come from all over the country. I knew I was going to have a good message because I got something from the Lord at breakfast for sure, for sure, and I knew I had it. Of course, I didn’t know what I had yet, but I knew it was coming from John chapter 5, the Pool of Bethesda, and from Jeremiah 23, about the false prophets. Somehow they were linked, but I had no idea how. Oh well, let Him lead and I will follow and we will see where He takes us. Stepping into the church was something else. The place was packed to the gills, the whole floor, both wings, and up in the balconies. If there was room to sit somewhere, I don’t know where it would have been. As I started getting ready (I still don’t know what the message is) I started praying and the Spirit just sorta came down on me like a bang and I started laughing. Not the silly spirit like there was in Toronto, but the laugh of faith when the Holy Spirit drops down on you. “Faith Laughs” is the old Brush Arbor saying. I knew it was going to be good … whatever it was. Well, the message fit together like a jig saw puzzle, as is always the case when God is preaching the message, and then all of a sudden it was over and time for the Altar Call. At first, no one responded, but I could feel it that there were people out there that were harboring secret sins, and for revival to visit this church, all sin had to go. I was about to close the altar when an old man came down. Wonderful, we have a soul. Then a woman came. Great, we have two. … then a couple young people … then two or three more … and then here they came. And came. And came. They just kept coming! I was beginning to wonder where they were coming from. Close to 250 souls answered the call for Salvation. Were they first-time salvations? I don’t know, but does it matter? They had sin on their soul that they had to get rid of, saved or unsaved, and revival was not going to come unless the church was clean. What made the difference here? Everywhere we have gone, it has been like this – maybe not as big, but at least as emotional. I believe that their desperate hunger for God is born from the terrible suffering they have gone through … and are still going through. War is still going on around us and life is hard. I try to imagine what it would be like to have lost your husband, to have your sons butchered in front of you, to have you or your daughter raped multiple times, have lost everything you ever had, and now you are living under a tarp in a refugee camp until the next outburst of rebels come and start a new round of slaughter. True, not everyone is a refugee, but the war has deeply affected everyone. No one has not been touched. 5.7 million people have died in these wars – how could they NOT be affected. Revivals are born out of desperation. This may be the people that God chooses to confound the wise, the mighty, the rich, and the comfortable so He can show forth His mighty power. That would be just like Him. They are certainly praying like they are. Money, money, money. Have you ever considered how much money affects your life? Too little and you are consumed with trying to get it; too much and it consumes you with trying to keep it. The only time it turns invisible is when you no longer care. But all that is a distraction. I have to keep my eye on the goal and not be swayed or derailed by the pressure of continually mounting expenses. If I allow myself to get vexed over this, I will not be able to deliver the message in the Spirit. The Spirit of God does not flow when you are vexed. And if I fail, the cost will not be in dollars, but in the inestimable cost of souls. Many years ago, my pastor told me something I’ve never forgotten: “Mistakes in this business”, he said, “unlike any other business, are fatal”. That kinda shocked me when I first heard it, but I soon realized how right he was. We cannot afford to make mistakes because we are dealing with human souls, and what we carry to them, and how we carry it, will affect their eternal destiny. I may only be able to minister to these people here one time – I get one shot at igniting a flame in their hearts – and I cannot afford to let the vexation of money to get in the way and take me out of the Spirit. If I do, I can say the same exact words to them, but those words won’t be able to pierce their hearts and touch their souls. It’s not the words, but the Holy Spirit that make the difference. So I’m just gonna plow ahead and get into my “Alfred E. Newman” mode (“What, me worry?”) and focus on what is important. I’ll let God worry about the small stuff.